Sergio Batista has announced his first Argentina squad as permanent boss, having been only caretaker manager when he named the squad to face Brazil late last year. 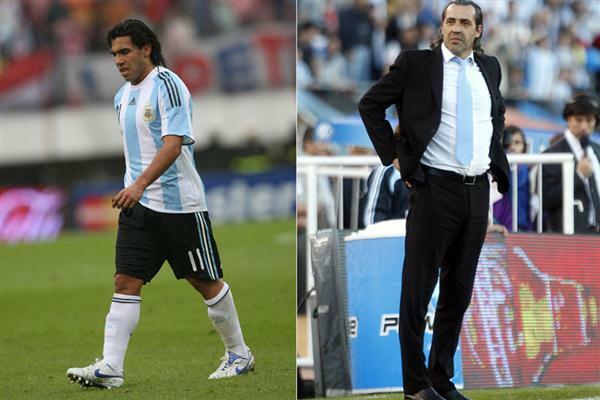 When Argentina take on Portugal in Switzerland on the 9th February, they’ll do so without senior squad members such as Carlos Tevez, Gabriel Heinze and Martín Demichelis, all rested so that Checho can take a look at some more junior players. Only two players from the Argentine league – Estudiantes’ Enzo Pérez and Vélez Sarsfield’s Juan Manuel Martínez – made the cut. All the names are right here. As well as the three senior omissions already mentioned, the Argentine press are getting quite excitable about the exclusions of Andrés D’Alessandro – who was unimpressive in his two recent call-ups – and even more bafflingly, Mario Bolatti, who’s been unimpressive in his career to date. ‘Those who’ve been left out won’t be out of consideration for the Copa América, or for any other matches.’ The main aim, though, has to be to start putting together a side for the 2014 World Cup, which will mean giving younger players a chance in defence especially. Hello again argentino fans! It’s been ages since I’ve been on here, but I may as well comment – I thought this game was taking place at the Emirates Stadium in London, not Switzerland? I was considering going, but not to Switzerland. Zabaleta, ah yes. He violently divides opinion amongst City fans, I love him and his genuine committment and am delighted to see him in this squad. I am just as delighted to see Tevez not in it. Are you doing anything on the Independiente Copa Libertadores game tonight? I can’t stay up to watch these matches in the middle of the night anymore, I’m going to have to wait until it appears to download on one of those snide sites. BTW, the podcasts are fab. Will be in touch soon Sam! It was originally meant to be at Ashburton Grove, Matthew, but they moved it to (I believe) Zurich. I forget exactly why.